There is nothing like tasty Italian lasagna to tickle the taste buds. This is the Italian sausage lasagna (read here other news). 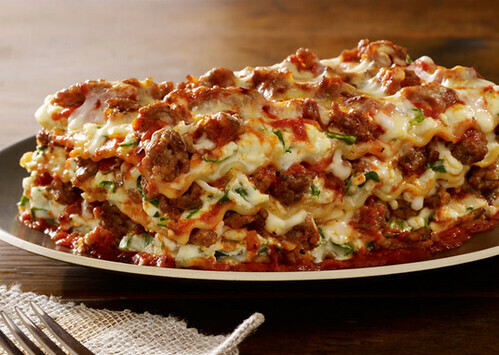 To make you will need 12 lasagna noodles, 1 poundsweet Italian sausage, 2/3 cupchoppedonions, 1/2 tablespoonminced garlic, 2/3 cupchopped parsley, 3 cans tomato paste, 1 cantomato sauce, 2 cups water, 1 1/2 teaspoonsItalian seasoning , 1 1/2 teaspoonsdried oregano, 1 1/2 teaspoonsdried basil leaves , 1 poundpart-skim ricotta cheese, 1 packagechopped spinach, 1/2 cupgrated Parmesan cheese , 3eggs , 2 teaspoons garlic salt, 1/4 teaspoon ground black pepper , and 3 cupsshredded mozzarella cheese. First preheat an oven to 350 degrees F and grease a 9×13-inch baking dish. Then bring a pot of salted water to a boil. Add the lasagna noodles and cook for about 10 minutes. In a saucepan over a medium flame, cook the sausages with onions, garlic, and parsley. Then add the tomato paste, tomato sauce, water, Italian seasoning, oregano, and basil and mix carefully. Allow to simmer for 5 minutes while stirring occasionally. In a separate bowl, mix parsley, ricotta, spinach, Parmesan, eggs, garlic salt, and pepper. Spread some sauce in the bottom of the baking dish and layer with 4 noodles, 1/2 cheese mix, 1/3 remaining sauce, and 1 cup mozzarella. Repeat and make last layer noodles, sauce, and mozzarella cheese. Cover pan with aluminum foil. Bake in the preheated oven for 45 minutes. Remove the foil and bake uncovered for another 10 minutes or until cheese is bubbly.